With financial factors of risk and value underpinning every business decision today, the days of finance operating as a stand-alone corporate function are long gone. Yet senior-level executives from non-finance areas — such as legal, operations, engineering, and sales and marketing — often lack the requisite finance skills to identify and effectively communicate the financial implications of their strategic initiatives. This module, Finance for Senior Executives, fills this need, providing participants with highly relevant, actionable, and practical tools to understand the financial implications of their decisions, create sustained value for their company, and communicate the rationale for their decisions to finance colleagues. Participants leave with a solid understanding of corporate finance and its role as a critical business skill set. 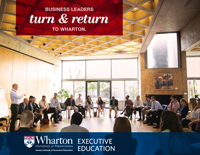 This module is taught by renowned Wharton finance faculty who will deliver the latest information about the private equity sector while teaching the latest concepts investors need to know to confidently evaluate investment opportunities in the private equity space. Managing a merger or acquisition can be one of the greatest challenges faced by an organization. To reap maximum value, leaders must consider multiple factors, balance short- and long-term needs, and guide well-planned execution — often under the watchful eye of their boards and investors. 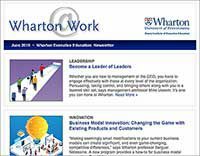 In Mergers and Acquisitions, an interdisciplinary team of Wharton professors makes sense of the complexities of this topic and helps you develop and implement successful strategies to support your company’s mergers and acquisitions activity. Venture capital is the fuel that drives emerging companies and ambitious entrepreneurs worldwide. But for every successful, disruptive, trailblazing start-up, there are dozens of other businesses that fail, even after receiving multiple infusions of capital. Value Creation and Growth through Innovative Corporate Finance offers a deep dive into the areas of corporate finance required for senior finance executives to make informed decisions and mitigate financial risk, including a macroeconomic view of today’s global economy. This module brings finance executives up-to-date on issues such as fintech and financial regulations, which are currently changing and disrupting the corporate landscape. Finance executives who are on the frontlines of such disruptions will particularly benefit from this session. Visit the SAIF website for more information.